The money was raised at a ball organised by Kiren Sharma, who runs Reading employment agency Gravity Personnel, and held at the Hilton Hotel in Reading in March. More than 340 people attended. Mr Sharma was helped by Sue Roberts, of corporate events firm Sue Roberts & Associates, with an auction and silent auction. Various companies donated to have their names included on the minibus. Mr Sharma, from Pangbourne, said: “The generosity of the public and the various companies that donated prizes and finances was unbelievable. “Sue Ryder is an absolutely fantastic charity which you don’t appreciate until you experience what it does. I experienced it a few months ago when my brother-in-law went into the Reading hospice. 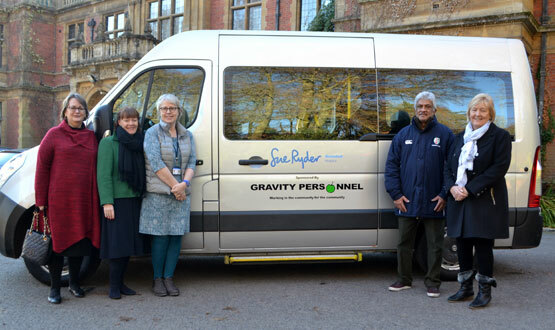 Tracey Hancock, head of fund-raising for Sue Ryder, said: “We are hugely grateful to Kiren and Gravity Personnel for supporting us and providing us with this transport which we wouldn’t have been able to provide ourselves.